Für Liebhaber von Landschaften, Meer, Berge und Ruhe. Haus F3 im Erdgeschoss, mit Garten und Gestrüpp um (nicht eingezäunt). 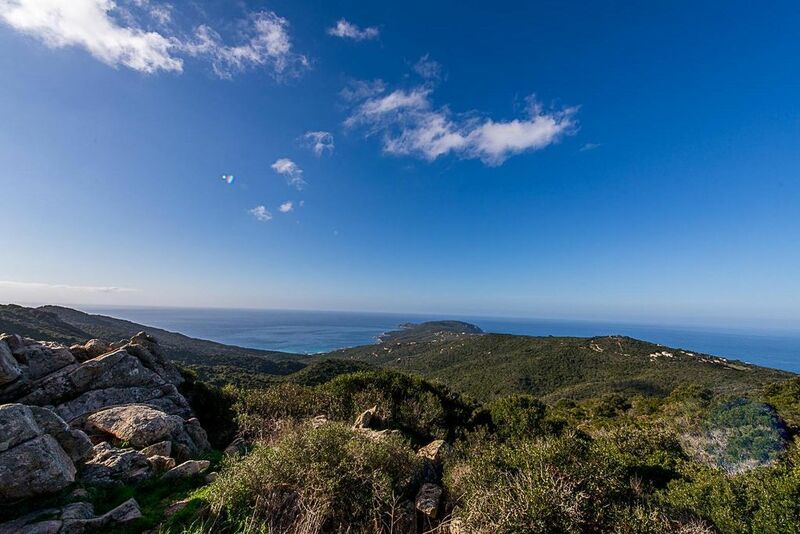 Panoramasicht auf das Archipel der Sanguin nach Sardinien, mit Blick auf Capu Di Muro. Ruhe, Gelassenheit und Ruhe gewährleistet. Viele Wanderungen (Biken für Sportler). Der Zugang zum Strand von Cala d'Orzo von einem Feldweg mit dem Auto befahrbar +/- 6 'da unten gehen, kann es (mehrere Hütten) wiederherzustellen. Porticcio Handelszentrum bei +/- 40 'die Hütte entfernt. Dusche mit Mixer, Spüle. WC separates WC. Außendusche. Steht Ihnen eine Seifendosis pro Maschine zu beheben. The most amazing place to stay! We rented this wonderful house in summer 2016. After booking, we had a great dialogue with The house owner. He was so friendly and helpful and helped us to plan our holiday a lot. When we arrived at Corse in the evening, we struggled finding the house. This is because it is located in the most beautiful countryside away from the buzzing tourist areas. So we gave the parents of the house owner a call and asked for help, and they actually went out by car to find us! Which they did! So the start was already promising, we felt very welcome. And the house? Well, it is the very best house we have ever rented. I have never seen a holiday house which is so well equipped with literally everything you need. They have all the stuff you need if traveling with a baby and the kitchen has everything you need for cooking. THe house i beautiful and the garden is outstanding. We spent many hours on the nice Terrasse watching the sun set over the ocean. By car you reach both restaurant and shops quickly, a beach is right downhill from the house. We had many trips to other places on Corse, the mountains and the south. Everything is in great distance by car for day trips. There is really nothing we didn't like. We recommend this place to both couples and families with children. Thank you so much for making our trip the best in our lifetime! We will definitely come back! Votre projet de vacances en Corse est resté un bon souvenir pour moi, vous veniez de loin pour visiter notre région, il fallait absolument que tout soit parfait! Je suis ravi que votre séjour en Méditerranée (et non au bord de l'océan:)) reste pour vous une référence. Merci beaucoup pour votre appréciation, elle est le reflet exact de notre gîte. Your project of holidays in Corsica stayed a good memory for me, you came by far to visit our region, everything had absolutely to be completed! I am delighted that your stay in the Mediterranean Sea (and not at the edge of the ocean:)) a reference stays for you. Thank you very much for your appreciation, it is the exact reflection of our holiday cottage. - Denken Sie daran, Geld auf Sie zu haben, einige Unternehmen keine Zahlungsterminals Kreditkarte. - Bei der Ankunft in Korsika (Ajaccio), beginnen die „lästige Pflicht Rennen“, zumindest für die ersten drei Tage (Frühstück, Mittagessen und Abendessen), für das Dorf Coti-Chiavari finden Sie eine kleine finden Lebensmittel. Ajaccio Sie den Markt und große Einzelhandelsketten, die Teilöffnung an Sonntagen finden. Porticcio, Fischerdorf an der D55 Straße, die zum Haus führt, werden auch Geschäfte: ein Champion, ein Spar, Bäckereien, Tabakbuchhandlung, Post, Bank, Bar / Restaurant, Kino usw. Für jeden anderen Punkt der Ankunft, werde ich Sie zu den besten Führer für Sie Ihren Aufenthalt in Frieden zu starten. - Sehen Sie Ihre Tankanzeige! Es gibt keine Tankstelle im Dorf. Insgesamt Tankstelle Porticcio dann letzten Pietros Ruppione sowohl für die D55.